My tender mercies never fail, for they are new every morning. because his compassion doesn’t fail. The NIV Bible says Lamentations 3:22-23 this way... 22 Because of the LORD’s great love we are not consumed, for his compassions never fail. 23 They are new every morning; great is your faithfulness. 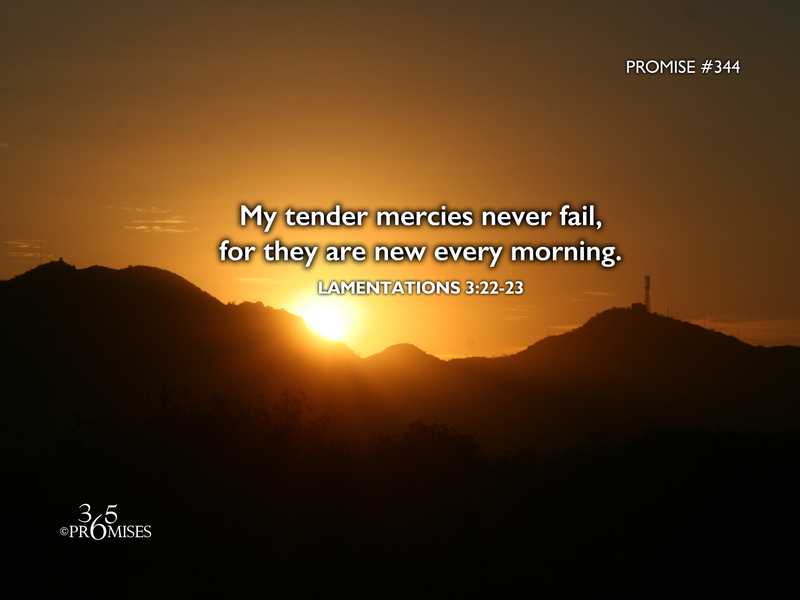 Not only does this promise say that God's tender mercies will never fail, but they are new every morning. Every day is a new day for God to reveal His love to us. When I think of this promise, I wonder if there is something in the heart of our God and Father that skips a beat every morning when we open up our eyes? Every morning He renews His commitment of love to us. What an amazing thought this is to me! Paul the Apostle declared in Romans 8:38-39 that he was convinced that nothing could ever separate him from the love of God that was expressed in Jesus Christ our Lord. It sounds like Paul needed to be convinced and I think we need to be convinced too! If that is the case, then every morning is a new opportunity for God to convince us that He really, really, really loves us and His love will never fail (1 Corinthians 13:8). My prayer for each one of us is that as we wake up every morning, we will be reminded that God's tender mercies are renewed again for us! God's love for you is unfailing and relentless and is new every morning!